The final word on everything that matters. 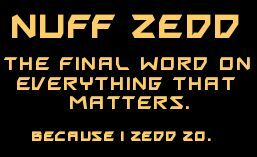 Because I Zedd Zo. Why Is My Internet So Slow??? In Daniel chapter 3 (NASB), we have the story of Shadrach, Meshach and Abed-nego. King Nebuchadnezzar had built a giant gold-plated statue. When you heard music, you fell down and worshiped the Big Gold Idol. If you didn’t, you were thrown into a furnace and roasted. Ah. When ol’ Neb said that, he deliberately placed his will against that of God, who had clearly told His children: you will have no other gods before Me. This was now a spiritual battle: a false god against the One True God. If he’d kept up with his nightly Scripture reading, the king might have known what would happen: the three Hebrews went into the furnace, were protected by a “fourth man” (heh) and were then pulled out, completely unharmed. Nebuchadnezzar had to acknowledge that their God was special (Daniel 3:28-30). There you go. Shadrach, Meshach and Abed-nego said: (a), we ain’t gonna do it; (b), our God is able to deliver us; and (c), even if He doesn’t deliver us, we still Ain’t. Gonna. Do. It. That, my friends, is true faith. Some people believe that, once you ask God for something, you’re not supposed to add qualifiers. The “Name It And Claim It” crowd (more on this in a moment) seems to feel that saying, “if it be Thy will” shows doubt or a lack of faith. But people who say that don’t really understand how this works. We’re back to the principle of submission: you trust God implicitly to know what’s best. If God really means for you to have something, you’re going to get it. If He doesn’t, you can practice all the mind control tricks, positive thinking and mental exercises known to man … and it won’t make a bit of difference. You’re going to be disappointed. In the past few decades, a subset of Christianity has sprung up that has variously been called, “Word of Faith,” “Kingdom Authority” or “Name It And Claim It.” There are variants and degrees, but all seem to center on the concept that, having been freed from the law of sin and death, and being partakers in Christ’s divine nature and the fact that He has overcome the world, we can use our “kingdom authority” to believe God for anything that we need. I happen to agree that God will supply all of our needs, “according to His Riches in glory, in Christ Jesus.” (Phillipians 4:19, NASB) Where we might disagree is in defining that all-important word, need. The fact is, folks, a good bit of my ministry has been dealing with people who’ve been badly disappointed, who have prayed for something, but who didn’t receive it. It doesn’t help that, if they’ve been part of one of these Word of Faith groups, their own friends turn on them and insist that they must have done something wrong, or didn’t have enough faith, or … something. Some of you aren’t going to like this, but I’ve kind of made a career out of saying things that no one else wants to. (Heh.) You’ve probably heard inspiring stories about (for example) the old woman who prayed for her son; who was then told that her son had died in prison; and she refused to believe it. In time, a big mistake was uncovered, her son was not only saved, but came home to her. Praise the Lord! Do I believe stuff like this happens? You better believe it! But I’ve also dealt with those who’ve read stories like that, and who then (against all objections, or even common sense in some cases) have continued to believe for something … only to be badly disappointed when it didn’t come to pass. The Word of Faith crowd believes that these folks didn’t have enough faith, or that there was sin in their life. Go away with that light and shine it somewhere else, because they don’t want to hear it. But I assure you, these people are out there and they’re heartbroken. They think that God doesn’t love them or that they did do something wrong. What we should be telling them is that God works all things to the good of those who love Him. All things. Not just some things; ALL. Name It And Claim It? Contrast this entire “Name It And Claim It” approach with the late Watchman Nee, who suffered and was then executed in communist China for his faith. Instead of looking for material possessions here on Earth, Brother Nee worked toward eternal wealth in Heaven. People like brother Watchman are the real heroes. He’s walking on streets of gold now, and I can only hope that when I get to heaven, I’m counted worthy enough to shine his shoes. If you are truly walking with God, united with Him and abiding in Jesus Christ, attuned to His plan for your life, you will want what He wants. His desires will fill your heart and you will find yourself praying for what He wants. Matthew 18:18 (NASB) — Truly I say to you, whatever you bind on earth shall have been bound in heaven; and whatever you loose on earth shall have been loosed in heaven. Matthew 18:18 (Amplified Bible) — Truly I tell you, whatever you forbid and declare to be improper and unlawful on earth must be what is already forbidden in heaven, and whatever you permit and declare proper and lawful on earth must be what is already permitted in heaven. I’ll state the obvious: there’s a world of difference between God giving you blanket authority to “name and claim” whatever your poor, limited brain thinks is appropriate … and God promising that if you abide in Him, and follow His Word, you can ask for something, knowing that you are asking for and within the furtherance of His Plan. Folks, my brain simply isn’t as good as God’s. (To put it mildly.) I might pray for something that, in the long run, might hurt me … or even worse, be at odds with God’s plan. That’s the last thing I want, so I trust that He knows best. I’ll try to get as close to Him as possible, to “abide” in Him and then pray according to what He has revealed to me. Now, God knows that we need food and shelter. I believe that He even knows that, in today’s society, we need transportation, and depending on your ministry, maybe even Internet access, radio/television and/or printing presses, to do the work that He has called you to do. Don’t misunderstand me; if that’s the case, these things WILL come to you, and there’s not an army of two-legged men on this planet that can prevent it. Further, I rejoice just as loudly as you when I read inspiring stories of how God has met needs like these. I certainly believe in miracles. I myself have been blessed beyond measure; my life has been one miracle after another. But rather than seeking these “wow” experiences, I’ve been trying to get closer to God, to find out what He wants for my life. Rather than believing Him for a new SUV or a new house, I’m asking Him how I can better serve him and fit into His plan. … and frankly, I’m glad of that. He’s a whole lot smarter than me!